The rath, like the borogove, was a puppet not required to do much, just stand about looking bewildered. So the body was sculpted and cast as a large piece of latex skin filled with soft cold foam. 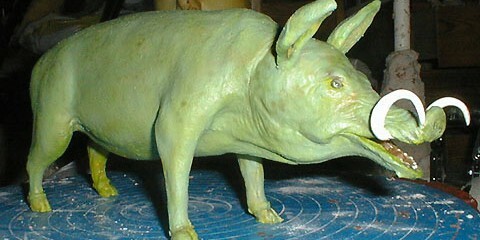 A four-part mold was made from the sculpture. It´s late in the day when I´m writing this and I don´t have the stamina to explain in detail how it was done. Look at the pictures.